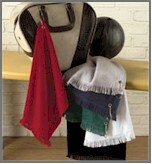 Flour Sack Towels, Golf Towels, Hand Towels & More! If you are looking for a great idea for personalized gifts, think about using our blank towels. We carry only first quality towel blanks in various different sizes and weights, from golf towels to beach towels, perfect for embroidery professionals and hobbyists alike.